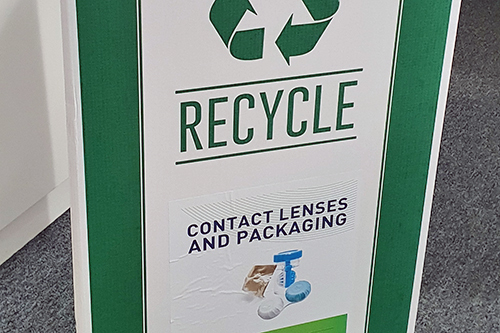 Contact lens wearers are now able to recycle their lenses for free at the City Sight clinic based at City, University of London, and where eye care examinations and contact lens services are available to the general public and local businesses. There are 3.7 million soft lens users in the UK, where over half wear daily disposables lenses. Unfortunately, the majority of the waste once worn ends up in the landfill or can end up in our oceans due to inability to widely recycle such products. “I believe that we have a responsibility, as one of the largest teaching institutions in UK optometry. We should be educating the next generation of optometrists regarding the disposability issues of contact lenses and their environmental impact. With the advent of recycling facilities only just becoming available in the UK, and by being pro-active in this department, we have set a precedent by increasing awareness of the issues of not recycling and its consequences. Hence we have invested in such services to be used immediately beginning January 2019. Wearers can dispose of their contact lenses regardless of which brand they use alongside their blister and foil packaging. The City Sight clinic is located at the University’s Northampton Square campus.